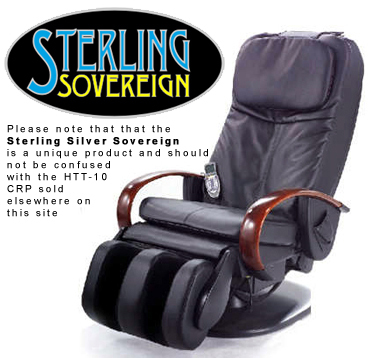 This new Sterling Silver massage chairs, with the removable 'Snug' head and back cushions offer comfort and style combined with the famous Sterling SuperWave massage system - the best you can get. 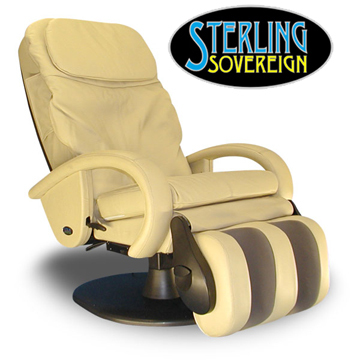 All the chairs in the Sterling Silver range will give the strongest massage currently available. If you want strong - look no further. Previously not recommended for the faint hearted, the Snug cushion and the ability to add softening pads to the massage cushion mean that these state of the art chairs can now be enjoyed by all . 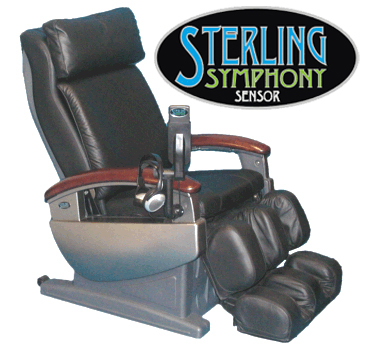 The Sterling Sensor system, in the Sensor Symphony, does not claim to know what massage your body needs - Sterling's engineers believe that you will always know that, better than any machine - it measures your body shape and weight and applies this information to its pre-programmed and memorised massages. It stores up to six individual body shapes and up to six different personalised massages - all can be recalled at the press of a button. With many thousands of options, massage type, position, width, force, speed etc. for both the back massage and airbag systems, simply set-up the massage you like and record all the settings for future use with the press of a button. When you try this sensor system you will immediately understand how it works and will not be left wondering if it really is sensing your body. All this combined with a built in MP3 music system with loudspeakers and headphones, make this the best chair on the UK market today. The latest state of the art, roller and airbag full body massage with body shape and size sensing and personal massage memories. Store and recall personal massage preferences and body shape data for up to six people. You don't get better than this! Airbag in the rear of the seat. with ten airbags for calf and six for feet. Download your favorite music and play back through the speakers or earphones, fully controlled from the handset. For added comfort, supplied with extra soft 'snug' back and head cushion that can be removed for that famous Sterling massage! Also available in a wide selection of colours to special order. The unique 24 point shiatsu rollers used in the "SuperWave" massage system have been developed by Sterling engineers to give the strongest of massages whilst still leaving you with all the control you need. If you like the system but not the full strength you can easily adjust this to suit you personal requirements. The massage cushion has zip pockets in the back to enable you add foam reducing pads in various thickness' - available free on request. This way you have full control over the force applied by the massage. Always remember, we can't make a weak massage stronger, but we can make a strong massage weaker. When you want a stronger massage simply reduce the thickness of the pads or remove the pads altogether. The rolling SuperWave massage unit is arranged with the ideal "tri-point" contact system on either side of the spine At the top of the unit's travel the single 24 point shiatsu rollers allow it to get deep into the shoulder and neck muscles, whilst at the bottom of it's travel it's twin 24 point shiatsu rollers ensure the best ever massage over the lower back and base of the spine. The seat and calf massage uses six airbags to provide a state of the art massage to the hips and legs. In addition, in auto mode, provides unique leg traction action extending and stretching the legs, ideal for relief of nagging sciatic pains. Combined, state of the art, roller and airbag full body massage. Triple rollers, in a triangular formation offer the best arrangement to provide state of the art neck massage whilst retaining the best lower spine massage available. The rolling SuperWave massage unit is arranged with the ideal "tri-point" contact system on either side of the spine At the top of the unit's travel the single 24 point shiatsu rollers allow it to get deep into the shoulder and neck muscles, whilst at the bottom of it's travel it's twin 24 point shiatsu rollers ensure the best ever massage over the lower back and base of the spine. The new leg and foot massage system also used in the Symphony Sensor uses a total of sixteen airbags to provide the very best automatic massage, all simply adjusted from the new LCD hand controller. Use one of the pre-programmed massages in a particular problem area or over the whole back area. Alternatively take control yourself and select spot, rolling, tapping or kneading massage in the areas of choice. Combine this with the advanced airbag system and you will certainly not be disappointed. Twin vertical air bags on either side of the back. During the course of the automatic airbag massage program the calves are grasped by the airbags and traction is employed by extending and lowering the leg rest. Is provided by tapping motors under each thigh, together they can provide relief from sciatic pain and increase blood circulation. 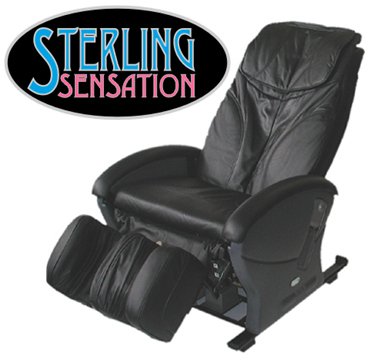 The fully rotating leg rest and calf massage uses an advanced mechanical compression system. Combined, state of the art full back massage with additional seat and calf massages. Four specially designed rollers, provide a superb deep neck and back massage with rolling, kneading and compression massages. You can select the type, intensity and position of the massage or simply use the automatic pre-programmed system to give an excellent 'all over' back massage. with intensity control is provided by a kneading motor system under each thigh, improving blood circulation and helping to relieve sciatic pain. The unique 24 point shiatsu rollers used in the "SuperWave" massage system have been developed by Sterling engineers to give the strongest of massages whilst still leaving you with all the control you need. This rolling SuperWave massage unit is arranged with a two point contact system on either side of the spine. The four individual 24 point shiatsu rollers provide a really strong massage over the whole back area. The seat massage employs a unique new triple roller system under each thigh whilst the calf massage is the best mechanical system currently available Use one of the pre-programmed massages in a particular problem area or over the whole back area. Alternatively take control yourself and select spot, rolling, tapping or kneading massage in the areas of choice. This is an ideal, no frills massage chair, for those who are young and fit and wish to remain so. 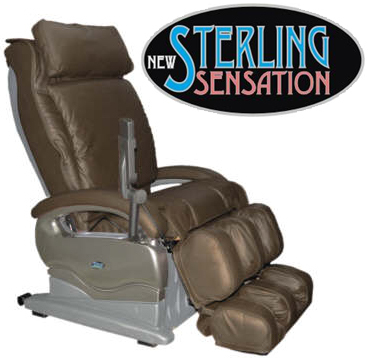 An advanced combined, disk and airbag massage systems provide a first class full body massage. Pre-programmed or manual massages can be selected to personal choice. Twin disks on a spine-shaped track offer rolling, kneading, compression and percussion massage with height and intensity adjustment. Is provided by two airbags in the rear of the seat. Is provided by airbags under each thigh, together they can provide relief from sciatic pain and increase blood circulation. If for any reason you are disappointed when you receive your chair, providing you re-pack it in it's original box so that it may be collected by TNT, the total amount you paid will be refunded immediately and without question! A full refund with no deductions! 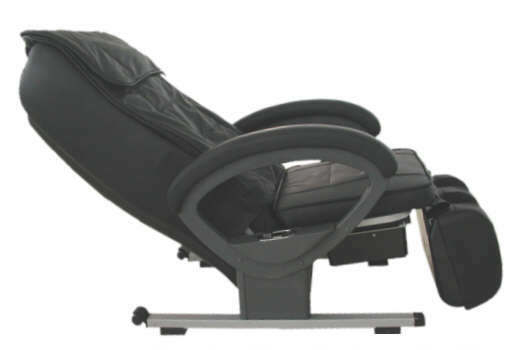 - only Massage Chair Distributors and their retailers offer this total reassurance.